A mysterious USB device appears. [ 4134.074640] [drm] Supports vblank timestamp caching Rev 2 (21.10.2013). [ 4134.081415] [drm] No driver support for vblank timestamp query. Yep, that's an Omega2 outputting a 1920x1080p@60Hz HDMI video signal. With a little help via USB. It's still a bit slow, though. Anyways, I'll now look into how I can write to the framebuffer directly either using the Linux DRI/DRM system or the mirrored /dev/fb0.. Okay, all of this Direct Rendering Instrastructure (DRI) and Direct Renderer Manager (DRM) is weird and probably more overhead than needed. I got mesa3D (libGL with OpenGL(ES)) support to compile, but the kmscube demo just won't display anything on its output.. A very simple DRM test program seems to recognize the correct resolution but just displays a black screen (not "no signal", but "all pixels are black"). I'm thinking about compiling X11/Xorg server for the heck of it, just to see if it runs.. Maybe even LXDE on top of it? Anyways, on Wikipedia I found libdlo. A libusb-0.1 library to bypass all the kernel drivers and directly talk to the DisplayLink USB device. With the libusb-compat_0.1.4-2_mipsel_24kc.ipk installed on the Omega2 and the library and its test-program cross-compiled, it actually does produce an output! Maybe I'll use this for a small test program until I figure out why writing to /dev/fb0 leaves the video signal on "disconnected" or figure out the right sequence of DRM commands with which the modetest program could output its nice colored test signal. cls... took 40 ms benchmarks the time it takes to fill the entire screen with black pixels and send it to the framebuffer. This should be more or less the time it takes to copy an in-RAM framebuffer via USB to the display. And 40ms on 1920x1080p means 25FPS. Pretty respectable for a USB 2.0 device. But my little gameboy emulator doesn't need that many pixels, so switching to a 240p resolution should make this thing waaaaay faster :). Full-Speed emulation for a Game Boy Color, at least. Less CPU time needed for pushing a framebuffer means that also higher console generation tiers (NES, SNES,..) might be possible with this approach. So I did compile this libDLO library and the performance was terrible. 23 FPS for copying a 160x144 RGB16 framebuffer over USB to the device. Turns out the above 40ms for filling the entire screen with one color uses a different code path, a way more efficient one, for crafting the USB packet. Will look into that. However, it turns out that this library internally converts the given framebuffer to a 24bit RGB framebuffer, pixel-by-pixel, and then tries to send entire rows to the USB device. Also, when make-ing the library, it compiled it without optimizations! So I did use CFLAGS="-O3", inserted the optimized library, and tada.. Game Boy Color emulation at ~90FPS. Internally I set the resolution to 640x480 and use the dlo_copy_host_bmp() function to copy the smaller framebuffer to the right position of the device's framebuffer. Will update the repos soon. So now you can play GameBoy and GameBoy Color on a normal monitor with HDMI/DVI/VGA input and this USB graphics card. However, this is still way to slow. The to-be-transfered framebuffer was really tiny here and the transfor should have gone even fast than that. The pixel-by-pixel conversion definitely hurts performance. Also I'm completly bypassing the entire Linux by not using the framebuffer device or the DRI/DRM functions, but writing directly to the USB device using libusb. I'll look into the performance of these two other methods once I get them working. Right now writing to /dev/fb0 doesn't update the screen and only one out of 2 test programs for the DRI/DRM system are working. Maybe has to do something with the kernel-mode-setting (KMS) routines. Another option would be optimizing the libDLO library to omit some sanity checks and use a more efficient frame buffer format that does not require pixel-by-pixel transforms. I'll see. Here's a link to a demonstration video! 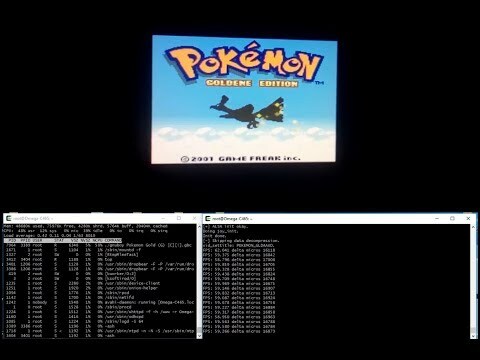 GameBoy Color emulation at 60FPS, properly synchronized using the audio. Using a DisplayLink DL-165, a FullHD monitor, a USB audio card and a WiiClassic I²C controller. I'll go the 'X11 Xorg server' route for a while and see where that takes me :).